I hope you don't mind me sharing a few more SU workshop cards with you today. We made these several months ago ... so they are a little out of season, but they are some of my favorite Stampin Up cards that I've made recently. I called this post "My Favorite Layout" because if you take a close look you'll see that each of the cards have basically the same layout, with just a few changes. This is my go-to layout of choice. It works with almost every stamp image I own, I think! Over the years, I have learned to embrace my own style with papercrafting. I found that I prefer to keep my layouts simple, so I can spend more time with coloring techniques and embellishments. I love all the sketches that are out there and use them for inspiration, but I always seem to revert back to a few of my tried and true layouts! I'm also very stingy when it comes to my designer paper. I have SO much of it, but I still can't stand to waste it! So, this plays a factor in my layouts as well. When prepping for classes, I almost always cut my 12x12 paper into 4" strips, so I can get at least 10-12 cards from each 12x12 sheet of designer paper. The first card was super simple. We used Craft ink spots to color & shade the bold images and then heat embossed it with my favorite SU embossing powder: Iridescent Ice. I love the sparkle of that powder! The butterfly was cut out and popped up for some added dimension. The second card features a favorite technique of mine and my SU customers: polished stone. 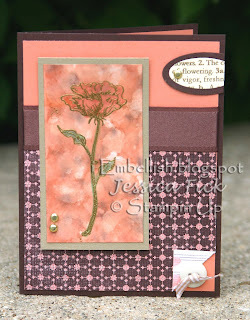 *Splitcoast Stampers has an awesome tutorial on Polished stone. Check it out here. * On the bottom paper, we stamped the Fine Lace background in versamark on glossy white paper, heat embossed in clear embossing power and then brayered over it with pale plum ink. The third card shows a technique of mine that I call 'painted polished stone.' I'm not sure if this is a real technique that anyone else does or not, but it's one of my favorite ways to make my polished stone images pop. After I finish my polished stone background and my stamped image has had time to dry, I take my reinkers and aqua painter and paint the image. It helps the image to really stand out and adds so much to my polished stone look, I think. Try it the next time you do your polished stone and see what you think! Have you tried watercoloring on glossy paper? It is so fun and I love how it looks when it's done. It's very vibrant and dries very quickly, by the way. Thanks for stopping by and have a great rest of your day! Gorgeous cards! I love your polished stone technique. I have just started using glossy paper and it is great. 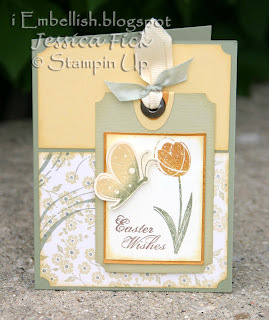 These are so beautiful Jessica! I too really love the polished stone bg one. I had never heard of that, is there a tutorial on it somewhere? All of your cards are gorgeous!! I must agree, I just love this layout. Works for just about everything. These are very beautiful cards. Jessica they're all darlin'!!! Love how different they all are and so many lovely details to look at! Jessica, these are all 3 so lovely! The layout is very similar and all are beautiful, but in such different ways! 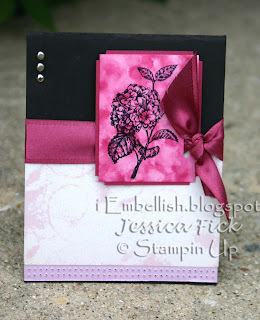 I love the look you achieved on the hydrangea cluster in that pomegranate--stunning! I would not call you stingy in the least--that is called resourceful and S-M-A-R-T in my book! :) hugs and tfs! These are GORGEOUS!!! I love the layout... will have to use it myself! Your cards are stunning and I can't wait to browse some more! I love these cards, too! I feel so lucky to have made each of them in one of your classes. They stay at the top of my "sample" box as inspiration. Thanks so much for sharing your talent ... I love reading your blog!